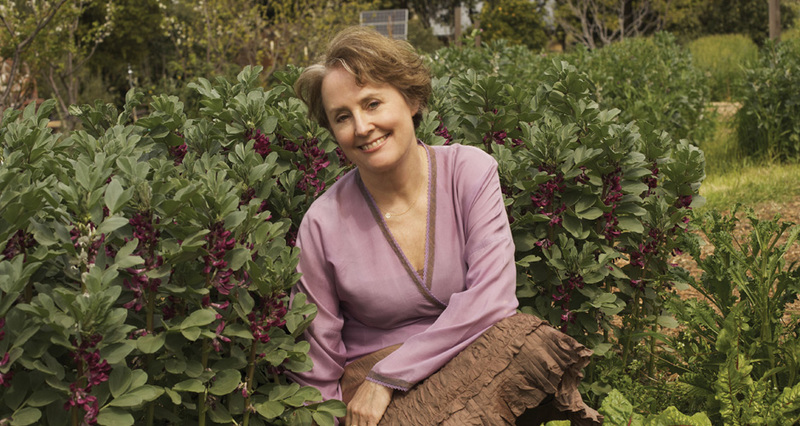 Alice Waters’ love for fresh, local food began when she was 19 years old. Whilst studying in France she lived at the bottom of a market street, which she would wander through daily, admiring the colourful fruit and vegetables that adorned each stall. It was here that she began to appreciate the beauty of seasonal, organic produce grown lovingly by local purveyors, and the experience sparked within her a lifelong love – for the joy of sharing simple food created from quality local ingredients. Upon returning to her home in California, Alice explored her newfound passion for food by cooking for her friends, which eventually led to the opening of her French-inspired restaurant, Chez Panisse. In the 40 years since, Alice has not only become one of the world’s most beloved chefs, but is now also a devoted crusader – through her Edible Schoolyard program – for educating younger generations on the importance of eating healthy, sustainable, local food. How did your love for food and cooking begin? I have always had a very sensitive palate, but I really fell in love when I travelled to France as a student. I loved the markets, the variety of beautiful produce, the simple way of cooking and gathering at the table to eat together. When I moved back to California, I wanted to create that life again and so I began to cook for my friends in my house. It almost sent me so broke that I had to open a restaurant. What started your passion for organic foods in particular? When we opened Chez Panisse, we weren’t thinking about a philosophy of organic, sustainable or local, we were looking for flavour, for real food – the kind of food I had tasted as a student in France and that was difficult to find in the US at the time. This search for flavour led me to the doorsteps of organic farmers, ranchers and fisherman, and into the wild to forage. I found that organic food, produced by people really taking care of the land was untainted, deeply flavourful and almost always more delicious than the product of chemical agriculture so I was converted. Soon after, the other positives for our health and the environment became clear, so it was simple to become an advocate for that sort of food and farming. Do you imagine that seasonal cooking and organic foods will one day be the norm in society? in terms of our health and the destruction of the planet. You’ve said that you still feel that you can change the world. How do you think that this can be done with food and cooking as the mediums? I am very hopeful and just one positive example of change is Michelle Obama planting a garden on the White House lawn. That one act really sent a strong message (at least in the United States but I imagine globally) about good stewardship of the land and the nourishment of a nation. The French philosopher Brillat-Savarin said: ‘The destiny of a nation depends on the manner in which it nourishes itself.’ I believe that to be true. Was there a particular experience that inpsired the beginnings of the Edible Schoolyard idea for you? Twenty years ago, a friend of mine established a working garden in a local prison and was having huge success in rehabilitating the prisoners in the garden. They were growing wonderful vegetables that they offered me for the restaurant on the condition I would come and see the program. I agreed to visit and as soon as I arrived in that garden I imagined the possibilities that this could have for children in public schools. I immediately thought a kitchen garden program integrated into the curriculum with a healthy school lunch would transform the local middle school. We ripped up the bitumen soon after and 14 years later we have a thriving program that brings kids into a new relationship to food. How do you envision the Edible Schoolyard concept will evolve over the next ten years? There are literally thousands of Edible Schoolyard-type programs across the United States now and we ourselves have affiliates in all sorts of locations and climates. I feel very good about that, but I would like to unite them under one banner so that we can speak more clearly to the powers that be in Washington that an Edible Education for all children is vital. You first opened Chez Panisse simply to entertain your friends – do you still find time to entertain them, 40 years later, following your phenomenal success? Yes of course! Chez Panisse is a local restaurant and we did not plan it to be anything more. I understand that it has obviously come to mean something else, but we still have regulars who eat in the cafe once a week. That is why we only take reservations one month in advance and we also have a three-course meal for $29. I never want it to be priced out of reach for my friends. I still remember when we charged the grand total of $3 for a full menu and even then thinking it was steep. I don’t think Chez Panisse has ever lost that democratic spirit. What has been one of your own most memorable eating experiences during your wealth of travels? Wherever I am, when I arrive in a new place the first thing I do is go to the local farmers market. You can always find something wonderful that is perfectly of that place/season/climate and culture. I am constantly delighted by what I can find and there is still a world of tastes that I am looking forward to exploring. To create a situation where work doesn’t feel like ‘work’, and a strong network of close relationships. I am a very reluctant public speaker and now I am called on to do that more frequently than I like. But, truly, my greatest challenge has been to stay true to the vision of what we have always wanted Chez Panisse to be. Personally, my daughter Fanny, and professionally, running Chez Panisse for almost 40 years. I also enjoyed receiving the Legion of Honour! Diversity – of ideas, of nature and of humanity. Carlo Petrini, Peter Sellars (the opera director), Maira Kalman, Olafur Elliason and the cooks and purveyors of Chez Panisse. I walk every morning to keep my sanity but I have to admit that, right now, there is not a lot of peace in my life with the 40th-anniversary celebrations of Chez Panisse this August and a new book on its way. A Delicious Revolution in the United States. I want the United States government to remove its subsidies to big agriculture and divert that money to a school lunch program that feeds every child a delicious, healthy school lunch for free. If we went into the schools in that way, supporting local farms in the process, not only would we tackle the health crisis head on and revive local economies, but we would be breathing life into our public school system, much like President Kennedy did with physical education in the sixties. Now that would be a real stimulus plan. My young assistant, David Prior, is Australian, a Brisbane boy who is now firmly a member of la famille Panisse. In terms of cooking, he knows how to cook simply and seasonally and to connect with local farmers. More broadly, the advice I give young people like him who are changing the future of food is to not think narrowly, but in the biggest possible way – revolutions can start from the smallest, most unlikely places. "Revolutions can start from the smallest, most unlikely places. "